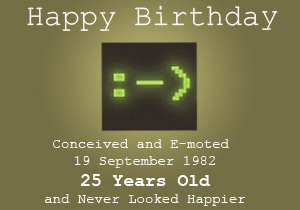 Happy 25th birthday, smiley face emoticon! Yes, I am the inventor of the sideways “smiley face” (sometimes called an “emoticon”) that is commonly used in E-mail, chat, and newsgroup posts. Or at least I’m one of the inventors. Fahlman, the author of the above quote and web page, may not have been the first to ever use the now-well-known emoticon, but there seems to be no evidence of anyone doing so before he proposed the iconic characters. For even more details, read more of the history of the smiley, which includes links to even more history.